As you may or may not know, the Beauty Resource team recently attended a delightful beauty bloggers event and got to take home some exciting new make-up and fragrances to try out. 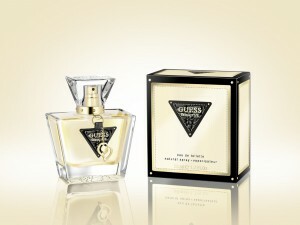 Second in line to face scrutiny is the new GUESS fragrance Seductive, which has been described by perfumer Veronique Nyberg as ‘an irresistible scent that exudes temptation, flirtatiously drawing in those around the women who wears it’. Well at the prospect of a spritz of Seductive turning us into a delicious smelling people magnet we literally couldn’t get the cellophane off fast enough. Post cellophane we first encountered the simple but classic cream box, framed with gold and black and featuring the famous triangle GUESS logo in the centre. The design of the bottle itself reflected the outer layer of the box, with the heavy glass bottle echoing the triangle shape of the logo and the embossed crocodile print panel reflecting the company’s signature use of animal prints. Attention to detail is even carried through to the base of the bottle, which again features the crocodile print which appears in other areas of the design. The cherry on top has to be the dainty golden heart charm which delicately hangs from the nape of the bottle neck, ensuring Seductive will be a firm fixture on any woman’s dressing table. The scent itself is deep but not overpowering with the base notes of Cashmere Wood, Vanilla and Olibanum giving the fragrance depth, warmth and a certain woodiness. The middle notes of Orange Flower, Jasmine and Orris add an exotic and classic touch but it is the top notes of Bergamot, Blackcurrant and Crispy Pear that really set the perfume apart, giving Seductive a modern and zesty edge ensuring it remains deep but not overpowering. In terms of longevity one spray to the wrist (& rubbed into the other) and another to the neck lasted for around five hours before a respray was required. This is a great versatile scent that can ether be worn lightly to the office or built up for the evening. Prices start at £25 for the 30ml Eau de Toilette, a very accessible and affordable price for a perfume and a steal considering all the complements we got!